Louanne is a graduate of the University of Notre Dame and Emory University. She has been involved with catechesis and Adult Faith formation across the Archdiocese for over thirty years. She has led many retreats as well as offering spiritual direction. On Tuesday afternoons men and women of this parish gather to pray and prepare for Sunday liturgy. Heeding the words of Pope Francis, we find the deep and lasting joy of the Gospel. The scripture readings for the coming Sunday are read aloud, explored from a historical and theological perspective, and reflected upon. Through mutual sharing, the meaning of the scriptures for day-to-day living are explore. The entire community is welcome. 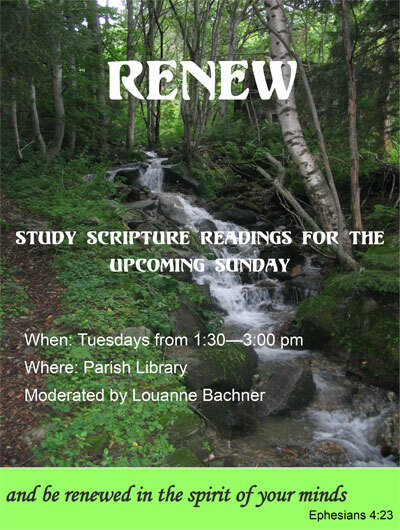 RENEW meets in the STM parish library. Classes are Tuesdays 1:30-3pm during the school year. The discussions and instruction I’ve participated in with our Renew group at St. Thomas More prepare me for Mass far beyond what I could do for myself. Learning the history, the cultural underpinnings, the context for all of the readings leads me deeper into the Mass, every week. Our group has, in most part, been together for fourteen years, and we’ve developed close relationships during this time. We’ve lost some friends through attrition, and others have moved beyond this mortal life, with our prayers for their life with Christ. We pray for each other, and for those whose names we bring to the group. The prayers of these friends have certainly helped me. I plan my week around the Renew meetings, and miss it terribly when I cannot attend, but I know that these people are praying for me. Louanne’ s expertise, guidance, friendship and patience bring out my better nature, and I thank her for that. I could fill the entire STM bulletin with my thoughts & feelings about Renew. Participating in this group deepens my understanding of scripture immeasurably. Often I leave the Renew group with an awakening of my spirit, and then, on the following Sunday Mass, a heightened awareness, appreciation, and love of God through the scripture readings, that, alone, I could never achieve. Through the years of attending Renew, I have encouraged family, friends ,fellow-STM parishoniers to come and experience Renew. I personally have asked for prayers, and have prayed for countless people, and souls I will neve meet, but am connected to through this ministery, which is truly a gift to us at STM. Thank you for giving me this opportunity to share my thoughts and feeling…..
We explore the Sunday readings in their aspects theological and historical, as well as their sometimes unexpected applications to our everyday lives. I love that every voice is welcome and valued.